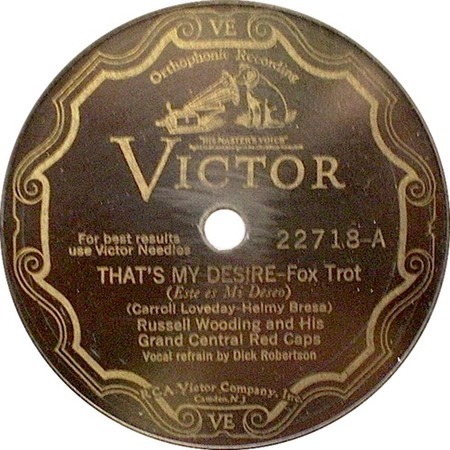 Carroll Loveday (words) and Helmy Kresa (music) published "That's My Desire" in 1931 and it was recorded for the Victor label in the May of that same year by little-known dance band leader Russell Wooding and his orchestra, with vocals by Frank Luther and released on Victor 22718. The number remained largely unknown, however, until Frankie Laine turned it into an emotional ballad during his first Decca recording session in August 1946. It went on to be his first hit in 1947, turning him into a major star. The recording made at the "Million Dollar Session," an informal session at the Sun recording studio that included Elvis, Jerry Lee Lewis, Carl Perkins and Johnny Cash, is dominated by Jerry Lee. Indeed, he might be the only one of the "quartet" actually performing! Elvis never recorded the number officially, but another informal recording was made in June 1968 during rehearsals for the "Singer Presents Elvis" TV special. This version is available on a number of "unofficial" releases, including "The Complete Dressing Room Session."